Can biodiesel become the new petroleum? And should it? Flickr photo courtesy of Robbi Baba. 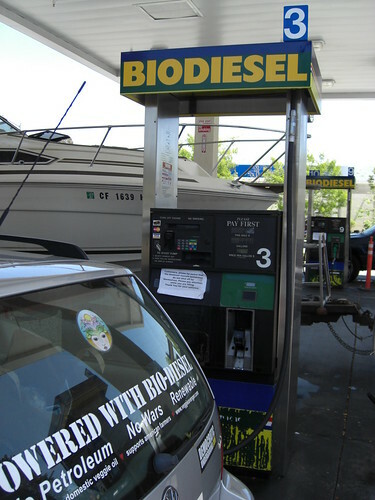 In just a few years, biodiesel in the U.S. has gone from an incognito fringe fuel to a mainstream media darling, and has recently been under fire as just another excuse for people to clear cut rainforest. If this first biodiesel wave has somehow missed you, and you have no idea what it is, there are many great resources to catch up, including articles on this site, which also address the commonly confused difference between straight vegetable oil and biodiesel. The purpose of this article is to push beyond the basics and evaluate the current state of biodiesel and take a look at the road ahead. Will it be filled with efficient diesel vehicles and smell like the local Wok Town restaurant? Will it be any cleaner or more peaceful? A cleaner, greener and more peaceful world â€” these are the reasons most biodiesel advocates began using and producing this fuel, because it promised to solve some of the problems created by the petroleum industry. These are certainly the reasons I chose to embrace biodiesel by creating an organization called bioTrekker, traveling the country in a biodiesel-powered motorhome to investigate and advocate this alternative fuel. I know I wasnâ€™t alone in my enthusiasm and I know Iâ€™m not alone in saying that, if biodiesel canâ€™t live up to these promises, I will no longer embrace it. Not many individuals seem to be happy about our extremely heavy dependence on Middle Eastern petroleum, and if Americans can once again produce the majority of their vehicle fuel domestically, the biodiesel theory goes, they would no longer need to entangle themselves in places like Saudi Arabia, Iraq and Iran. In addition, as a cleaner burning fuel, biodiesel could have a global warming benefit. Pure biodiesel is biodegradable and non-toxic, and when combusted, it emits as much as 78% less carbon dioxide than petroleum, 100% less sulfur dioxide, 55% less particulates (soot), 45% less carbon monoxide and a reduction in all cancer causing polycyclic aromatic hydrocarbons. Depending on engine type and age, it can increase or decrease nitrogen oxide emissions by five to 10%. Supporters also point to the fact that biodiesel closes the carbon loop. When petroleum is burned, it releases carbon dioxide that was removed from the atmosphere by now fossilized plant matter. When biodiesel is burned, it releases carbon dioxide that was harnessed from the atmosphere weâ€™re breathing now, thus closing the loop. To be honest, when it comes to using biodiesel to reduce our dependence on foreign oil and the handful of companies that control the production of that oil, weâ€™re not doing so hot. In 2006, the U.S. produced roughly 250 million gallons of biodiesel, and the total estimated tally for 2007 could reach as high as 400 million gallons. * Still, we consumed more than 60 billion gallons of petroleum diesel and 150 billion gallons of gasoline. * Whatâ€™s more, roughly 75 percent of the biodiesel produced in the United States was exported to Europe and used there. * Europeans pay higher prices for fuel, and no good capitalist is going to ignore that. In addition, a loophole in the fuel tax laws of Europe and the U.S. allow U.S. biodiesel producers to â€œsplash and dashâ€ and claim a tax credit in both the U.S. and Europe, letting them subsidize their production with tax payer dollars on two different continents. Even with this miserable performance, there is still hope, which is why Iâ€™ll go with an F+. The biodiesel industry has been driven by a combination of consumer demand and a strong Midwestern farm lobby, however, most insiders know that it wouldnâ€™t exist without the consent of the petroleum industry, especially on the distribution side. But most production at this time does seem to be outside of the hands of the oil company majors. As of January 2008, there were 170 U.S. biodiesel plants in existence. * Most use soybean oil as a feedstock. While some of the larger facilities have ties to big petroleum, such as Chevron-backed BioSelect Fuels in Galveston, Texas, many of these plants are financed by groups with farm ties and most have a capacity smaller than 30 million gallons a year. Even most of the largest in the country â€” such as Washington stateâ€™s Imperium (100 million gallons a year), Texas-based GreenEarth Fuels (90 million), and Indianaâ€™s Loius Dreyfus Agricultural Industries (80 million) â€” still seem to be independent of big petroleum ties. The production and distribution system may not be ideal, but itâ€™s still decentralized. Itâ€™s true that the actual combustion of biodiesel produces fewer GHGs (greenhouse gasses) and toxic gases than petroleum, and general lifecycle studies showed that biodiesel could lower GHG levels worldwide. However, these studies didnâ€™t foresee that a biofuels boom could create tremendous land-use changes in developing countries. For example, the huge corn-based ethanol push in the U.S. has created a soybean vacuum, which has Brazilian farmers slash and burning their Amazon rainforest to plant more soy. Malaysian palm growers are also slash and burning their rainforest to meet European and U.S. demand for palm oil based biodiesel. Needless to say, if you want to lower greenhouse gases, slash and burning the rainforest trees is the exact opposite of what you should do. Recent studies have demonstrated that biofuel-production could actually contribute to global warming if these land use changes are factored in. So why the plus on that D? Well, itâ€™s not exactly fair to blame a non-toxic, less polluting substance for the stupidity of those producing it. Chocolate is a wondrous, plant-based product that brings people pleasure, but I wouldnâ€™t blame chocolate if people got rid of all the other trees and plants in the world to mono-crop cocoa beans. A balanced, GHG lowering approach to biodiesel is possible, and it is happening, although on a smaller scale. For example, there are several biodiesel producers around the country who have made a commitment to produce biodiesel in a sustainable way. Most of them are using waste grease recycled from restaurants and/or source their biodiesel from locally grown feedstock oil such as canola, mustard or soybeans, grown on pre-existing farmland. The U.S. has an advantage here, because weâ€™ve already clear-cut most of our forests. Itâ€™s easy to project two very different futures for biodiesel, and reality will likely fall somewhere in between. On one side of the spectrum, a biodiesel gold rush could very well cause more problems than it solves. Most have already been mentioned, but biodiesel-caused problems include food shortages in developing countries, increased food prices in developed countries, the clear cutting of virgin forest to plant biodiesel feedstock crops, and Iâ€™m pretty sure theyâ€™re responsible for the recent writerâ€™s strike in Hollywood. In addition, if the biodiesel industry becomes controlled by mega corporations that profit by centralizing the production of energy and exploiting resources and cheap labor in other countries, then it will probably create or aggravate the same political, military and economic problems that petroleum has. 1.Help create communities that embrace mass-transit and make it easy to walk and ride a bike, developing in ways that will reduce the need for long commutes. Rather than simply ramping up supply to meet an astronomical demand, we can bring the demand down by using our energy wisely. A specific example would be getting involved with an office of sustainability like we have here in Portland, OR. If your town doesnâ€™t have one, why not start it yourself? 2. Clamor for better energy efficiency, such as diesel-electric hybrid engines. This is another way to bring down astronomical demand. People are good at clamoring and seem to enjoy it, so hereâ€™s something to clamor for. Support manufacturers that sell high efficiency products and perhaps suggest the idea to those who arenâ€™t. In this way you can help create a bigger market in the U.S. for biodiesel, which will help curb foreign exports of the fuel. Theyâ€™re already getting the hint, but hereâ€™s one place to start clamoring: www.autoalliance.org. 3. Support sustainable biodiesel production. Itâ€™s clear that not all biodiesel is created with the same intentions and priorities. As a consumer, ask questions of your local fuel distributors and try to get to know your local producers. Is the fuel coming from local fryer grease or local farmer coops? Is it being shipped in from overseas? Are they committed to sustainable practices? 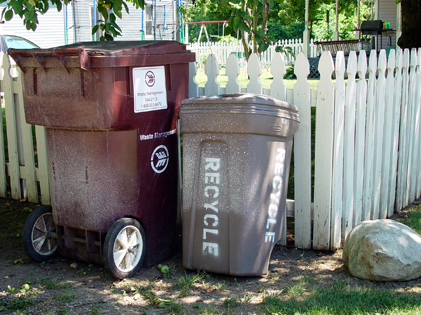 If youâ€™re producing biodiesel, do the best you can to minimize waste and pollution in the process by researching best practices. Consumers and producers can also join the Sustainable Biodiesel Alliance, (www.fuelresponsibly.org) a non-profit organization dedicated to promoting sustainable biodiesel practices. 4. Incentivize biodiesel produced from waste products and crops on existing agricultural land or fallow land. Currently, biodiesel producers who use waste grease as a feedstock donâ€™t receive as much of a tax credit as those who use virgin oil: this should be changed. And in addition to asking legislators to close the tax loophole that allows â€œsplash and dashâ€ producers to exploit domestic and foreign subsidies, we can ask them to reward producers that source their feedstocks from waste grease, existing agricultural land or land that was previously fallow. And, of course, we can incentivize it ourselves by patronizing companies that engage in these practices. 5. Rapidly develop non-food biodiesel feedstocks by investing in research and development. Of course, even if we drastically reduce our consumption, we still canâ€™t make enough biodiesel from cropland or waste oil to reach fuel self-sufficiency. Fortunately, there is promise in one of the fastest growing organisms on the planet: algae. Algae can have extremely high oil content â€” oil that can be turned into biodiesel once extracted. Whatâ€™s more, algae can grow in wastewater and brackish water so itâ€™s feasible that algae production would not create the same land use issues as soybean, canola or other cropland biodiesel. There are several companies currently working to commercialize algae production worldwide, including LiveFuels Inc., Solazyme, Solix Biofuels, GreenFuels Technologies, GreenShift CleanTech, and AquaFlow Bionomic. Initial studies of algal oil yields indicate that it may be possible to produce enough algal oil biodiesel to offset upwards of 50 to 100 percent of the petrodiesel that Americans consume, however, there are significant obstacles. The big one is how to produce algal oil as cheaply as petroleum. The other obstacles revolve around this, but a few include the challenge of extracting algae from vast amounts of water, the challenge of extracting oil from algae, and the challenge of creating a system that is energy efficient and resistant to other contaminant strains of algae. Still, biodiesel produced from algae is happening now, and could become available on a small commercial scale in the next two to five years. Algae experts, such as John Sheehan VP of Strategy and Sustainable Development for LiveFuels, say that large-scale commercial algae production probably wonâ€™t happen until sometime between 2012 and 2018. As individuals, we can speed this process by spreading awareness of this technology, investing in it ourselves if we are able, and by urging our local, state and national lawmakers to guide public investments in this direction. If the future of biodiesel is to be one that creates a cleaner, greener and more peaceful world, the solutions above will likely play a huge role. If they do, biodiesel will truly move beyond a fringe fuel and become one of the most important fuels in the next 20 to 50 years as we begin to transition to renewable energy, especially if coupled with the jump in fuel efficiency that would come with a major influx of diesel, diesel hybrids and electric passenger vehicles. The cleanest future is probably one where we run all vehicles on electricity produced from a renewable energy powered grid, but it looks like that transition could take at least a few decades. In the meantime, if we do it right, biodiesel could be a very beneficial in that transition. The beauty is, we can choose to have a say over how itâ€™s done, especially in our own communities. And this is the reason that I have not lost my enthusiasm for biodiesel as a very useful tool â€“ one of many tools that we can use to shape a better world for our children and grandchildren. But like any other tools, from ropes to knives to gunpowder, I have learned that biodiesel can only be as beneficial or destructive as the people who use it. Seen in this light, the important thing becomes the philosophy behind the tools. We can live in a society that achieves self-sufficiency by making it a priority to lower its energy needs and producing most of its energy on a community, state and regional level. We can live in a society where we mimic nature by creating systems where everything is used and â€œwasteâ€ becomes a forgotten concept. This is the society I choose to embrace and this is the peaceful, affordable and comfortable future that sustainable biodiesel can help create. Weâ€™ve just got to get our grades up. Ty Adams is a freelance writer and editor who takes on way too many pet projects in Portland, Oregon. In 2006, he left his desk job, sold his house and traveled the country for a year in a biodiesel-powered motorhome as part of a project called bioTrekker. The project continues to evolve and now has Ty living and breathing all things renewable and sustainable. It is available online at www.biotrekker.com. The fact that you’re even addressing biodiesel issues in the first place is certainly a step in the right direction. While biodiesel will obviously solve some problems, it will inevitably lead to others. You mentioned Malaysia with respect to slash and burning forest– but the real horror is going on in neighboring Indonesia. Sumatra and Borneo are being burned to the ground at the rate of 6 football fields every minute of every day. When you fly over these islands, the once great tropical rainforests are simply gone– replaced by industrial oil palm plantations the size of small cities. So much carbon is being released into the air and so much smoke is drifting North that it’s becoming impossible to measure the extent of the damage. When the forests are destroyed every living creature is extinguished. My non-profit organization– Orangutan Outreach– is working to draw attention to the crisis facing one of them: Orangutan. These gentle red apes are literally being wiped out– adults are being shot, burned and hacked to death by machetes– often buried alive–and sometimes even eaten by poachers. Babies are routinely captured alive– ripped off their dying mothers so they can be sold into the illegal pet trade. My organization works directly with the Indonesian org Borneo Orangutan Survival to try to protect the orangutans. Our primary project is an orphanage called Nyaru Menteng and has been featured on the BBC and most recently on Animal Planet’s series ‘Orangutan Island’. We care for orphaned orangutans and teach them how to be wild again. We have over 650 of them at the center– the vast majority of whom saw their mothers slaughtered as palm oil companies moved into their territory. While there are noble efforts being made to grow sustainable palm oil, we are still far away from having an adequate monitoring system on the ground. So for now, the palm oil going into your biodiesel, shampoo, cookies, cakes, chips and soap…. comes at a terrible price. Please consider this when you turn the key in the ignition…. Great post – the algae biodiesel effort isn’t getting nearly enough pub. I’m ready to help change that. Interesting read. I’d love to see this site continue to update algal biodiesel efforts. The focus on sustainability is huge. Thanks! Real informative. I’ve been running my car off Waste Vegetable Oil for over a year and am now doing biodiesel research at my college and have to say there were several things I haven’t thought of after reading this, thanks! richard zimmerman’s post is on the mark. i would like to thank you, richard zimmerman, and all of your staff and volunteers for the hard work you do! orangutans are going lost & wandering hungry, being sold in the illegal pet trade, used for prostitution, inconceivably slaughtered, and wiped out as amazingly intelligent and gentle beings. they share 97% of our dna! reading about the palm oil crisis, relating to orangutans and their only home, the tropical rain forest is imperative! thank you so much for people shedding light on what really goes into your fuel, cookies, shampoo, and cosmetics!